The story of the Royal Enfield Flying Flea has to be one of the most unusual motorcycle sagas ever. The Flying Flea was something completely different, from its cheeky origins as a slap at the Nazis, to its wartime service being pushed out of airplanes, to its whimsical (but workable) rubber-band front suspension. Most unusual for Royal Enfield was that the Flying Flea was not its own design. It was largely a copy of the German DKW RT98 motorcycle, which was selling very well in Holland before World War II. The Rotterdam importer was Jewish owned, however, so in 1938 the Nazis pulled the concession and gave it to someone else. The original Dutch importers turned to Royal Enfield for a copy of the RT98 to sell. The engine size was increased to 125cc to put the German original in the shade. The English model was called the "RB" (for Royal Baby) to exploit the connection to the DKW RT. Prototypes were displayed in Rotterdam in 1939, but few reached the public before war broke out in September. In Britain, the Model RE, as it was officially known, was enlisted for military service. 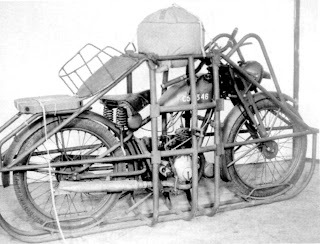 In particular, its light weight meant it could be dropped by parachute in a tubular crate Royal Enfield also produced. The nickname Flying Flea was a natural. In theory, the "light weight" of the motorcycle also meant it could be lifted over obstacles like stone walls and fallen trees, making it a truly cross country machine. Try that with a Jeep. A picture from the archives of the Imperial War Museum shows a British soldier lifting a Flying Flea, if only barely. It weighed 125 pounds. Note in the picture that the bike he's lifting carries the prissy civilian tire pump and bulb horn, full fenders, saddle bags and drinking cup. 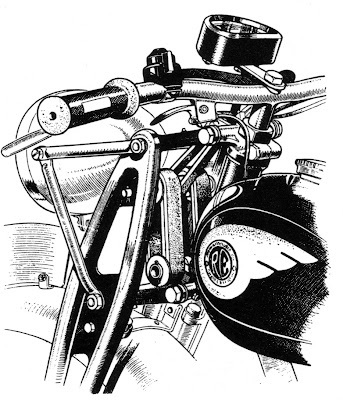 Copied from DKW was the front suspension of girder forks operated by three rubber bands. Two of them cushioned the bike under compression, the third provided rebound. The Flying Flea motor was a two-stroke. The three-speed transmission had a hand-change lever on the tank. The military added a folding kickstart lever to get it out of the way of brush. After the war, Royal Enfield continued building steadily improved models of the little motorcycle for civilian use right up until 1962. I'm indebted to Roy Bacon's book Royal Enfield, The Postwar Models for the story of the Flying Flea. 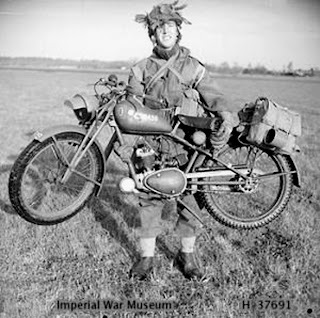 Pictures here are from that book, the Imperial War Museum and Gavin Birch's book, Images of War, Motorcycles at War. Also, see my earlier post on World War II re-enactor Andy Chant and the Flying Flea he used in his museum exhibit. I own a "Flying Flea" that I'm trying to restore, very hard to find parts!